Is the 2017 Atlantic Hurricane Season Here Already? From my vantage point of southeast Florida I can see a rather large storm cell in the northwestern Caribbean, off the coast of Quintana Roo state in Mexico, covering more than four million square kilometers and already causing heavy rains throughout Central America. the Caribbean and major Antilles and even most of Florida, which is also showing some potential cyclonic tendencies. I also see another strong and large tropical wave close to the western terminus of ‘Hurricane Alley’ approaching the minor Antilles, which also shows potential for tropical cyclone development. Does this mean the “official” 2017 Atlantic Hurricane Season is about to get underway? Some would argue that the season already got an early start when Tropical Storm ARLENE formed in the Atlantic basin around mid-April 2017. But since the officially human designated start date for the 2017 Atlantic season is June 1, I would argue that the “official” start of the season is still ahead of us. GOES EAST satellite image (NOAA) of 18 June 2017 in the evening over the Caribbean, showing the rather large storm cell off the coast of the Yucatan peninsula in Mexico, which is generating heavy rains from the eastern east Pacific sub-basin to Jamaica and Hispaniola and over most of Florida, and it is also showing above average potential for tropical cyclone development as it moves northwestward toward the Gulf of Mexico. Looking at the Caribbean and Hurricane Alley approaching the Windward Islands, the gateway to the Caribbean, there are two large, rather strong and menacing storm cells. which appear to be ready to mark the “official” start of the 2017 Atlantic Hurricane season. The storm in the northwestern Caribbean off the eastern coast of the Yucatan Peninsula, is moving mainly northwest toward the Gulf of Mexico. It appears this storm will cross over the Yucatan to then emerge over the southwestern Gulf with above average potential for tropical cyclone development. 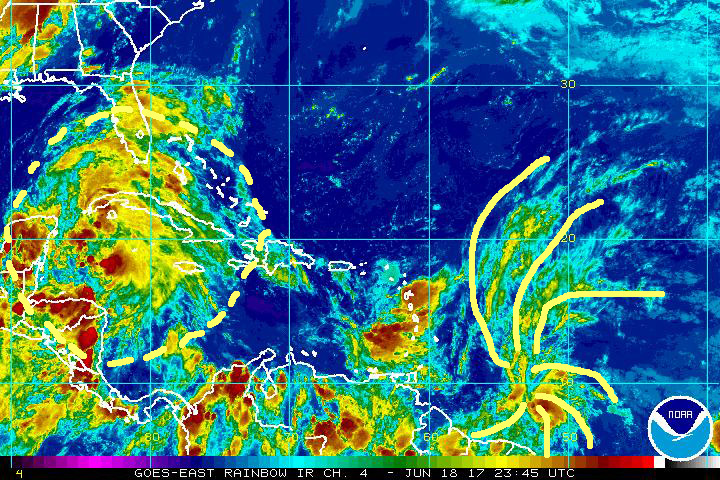 This is a rather large system close to 2,000 kilometers in diameter that is generating vast amounts of rain from Panama to Florida and the eastern east Pacific to Jamaica and Hispaniola. This system is being monitored by the National Hurricane Center and it warrant attention from all interests i Mexico, the Antilles, Florida and all states around the Gulf of Mexico in the next 2 -3 days. The storm at the western end of ;Hurricane Alley’ approaching the Windward Island and eastern Caribbean is the one that has most of my attention. 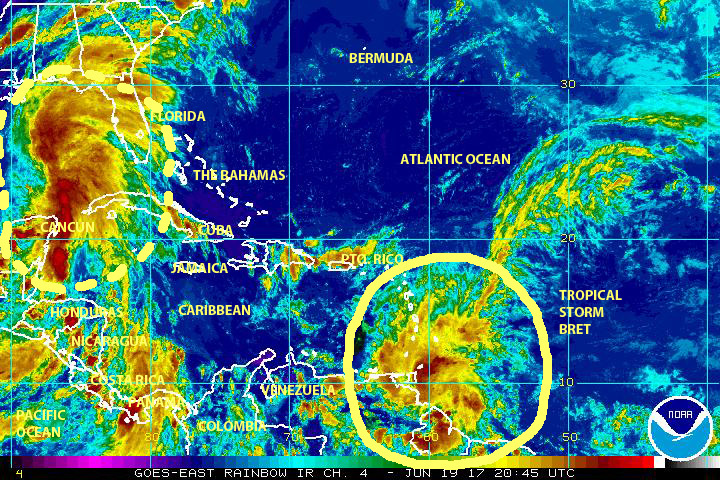 This storm is moving west and based on its peak sustained winds it may have already reached tropical storm intensity. A close analysis of satellite imagery including wind is showing spiral bands converging toward a center of low pressure, an indication of strong cyclonic tendencies. I recommend all interests in the Caribbean, Gulf and Florida region need to monitor this system closely over the next 2 to 3 days. The official 2017 Atlantic Hurricane Season may be about to start. This is the time to remain alert. Be prepared. MITIGATE!